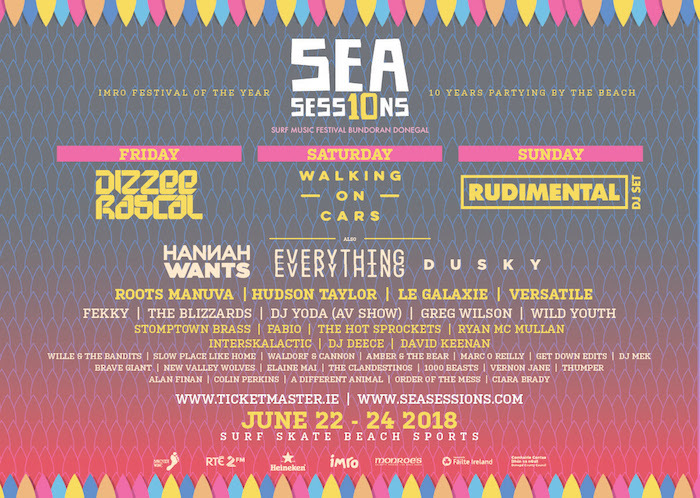 Dizzee Rascal, Rudimental and Walking On Cars will be the headliners of the tenth edition of Sea Sessions. They will be joined by Everything Everything, Hannah Wants, Dusky, Roots Manuva, Hudson Taylor, Le Galaxie, Fekky, The Blizzards, Versatile, DJ Yoda (AV Show), Wild Youth, Greg Wilson, Stomptown Brass, Fabio, Ryan Mc Mullan, The Hot Sprockets, DJ Deece, David Keenan, Wille & The Bandits, Slow Place Like Home, Waldorf & Cannon, Amber & The Bear, Marc O Reilly, Get Down Edits, DJ Mek, Brave Giant, New Valley Wolves, Elaine Mai, The Clandestinos, 1000 Beasts, Vernon Jane, Thumper, Alan Finan, Colin Perkins, A Different Animal, Order of The Mess, Ciara Brady with more to be announced. Tickets are priced from €99.90 for three days and €124.90, including four nights camping. There are also limited day tickets available from €49.50 and Surfers’ Bar upgrades from €50 extra.